Cairn – Similar to a barrow, a cairn is also a burial mound dating to the Neolithic, Iron and Bronze Ages. Rather than being constructed of earth, cairns are made of loose stone which are then covered in earth. Chamber - The area inside a megalithic tomb where a burial is placed. Chancel - East end of the church in which the altar is placed. Chevron - V shaped design that creates a zig-zag shape when place side by side. Cillin - Burual ground for unbaptised children. Cist burial - Found underground with a stone base, sides and top. Can be found near standing stones and often have a covering barrow or cairn. Neolithic/Bronze Age. Cloister – Common part of a monastic settlement. A cloister consists of a covered arcade. Closing stone - A stone which closes a megalithic tomb once a burial has been placed inside. Coarb – The heir (abbot) of a monastery. Corbel – A stone that projects from a building with the purpose of supporting roofs and floors. Crannog – Artificial island on a lake formed by a ring of large boulders being dropped into the water and the inner portion being filled up with earth and brushwood. These generally date to the early Christian period and were used as dwellings. Crenallation – Crenallations are also known as battlements and are usually high up on buildings and are parapets divided into short lengths with frequent embrasures. Cross slabs – Cross slabs are early Christian slabs of stone on which a crucifix has been carved. These were later replaced by high crosses. They usually date from the 6th to 9th centuries. Crypt - An underground chamber in a church. Cup Marks - Circular shapes found in rock art called cup marks because they look like a cup ring. 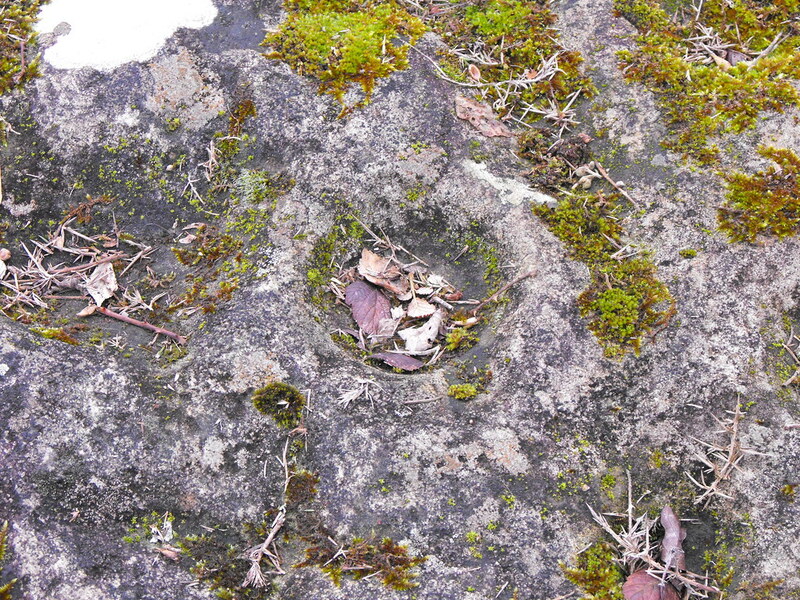 Cup mark on the Clonfinlough Stone in Co. Offaly. Curtain wall - Similar to a bawn (associated with towers houses and fortified houses). An encompassing defensive wall around a medieval castle and grounds.